Ready to use. The PINK Prestained Protein Ladder contains 11 proteins that resolve into sharp, tight bands in the range of 10-175 kDa. The PINK Prestained Protein Ladder allows you to monitor molecular weight separation during electrophoresis, estimate molecular weights of proteins of interest, and evaluate western transfer efficiency. The BLUEplus Prestained Protein Ladder is a three-color protein standard with 10 pre-stained proteins covering a wide range molecular weights for 10 to 180 kDa. Proteins are covalently coupled with a blue chromophore except for two reference bands (one green and one red band at 25 kDa and 75 kDa respectively) when separated on SDS-PAGE (Tris-glycine buffer). The BLUEplus Prestained Protein Ladder is designed for monitoring protein separated during SDS-polyacrylamide gel electrophoresis, verification of Western transfer efficiency on membranes (PVDF, nylon, or nitrocellulose) and for approximate sizing of proteins. The ladder is supplied in gel loading buffer and is ready to use. Do not heat, dilute, add reducing agent before loading. The BLUEplus (wide) Prestained Protein Ladder is a three-color protein standard with 13 pre-stained proteins covering a wide range molecular weights from 3.5 to 245 kDa. 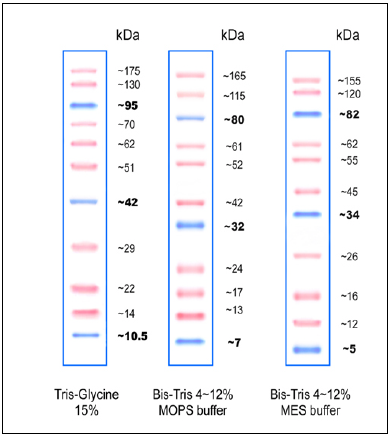 Proteins are covalently coupled with a blue chromophore except for two reference bands (one green and one red band at 25 kDa and 75 kDa respectively) when separated on SDS-PAGE (Tris-glycine buffer). The BLUEplus (wide) Prestained Protein Ladder is designed for monitoring protein separation during SDS-polyacrylamide gel electrophoresis, verification of Western transfer efficiency on membranes (PVDF, nylon, or nitrocellulose) and for approximating the size of proteins. The ladder is supplied in gel loading buffer and is ready to use. Do not heat, dilute, add reducing agent before loading. Ready to use. Contains a unique combination of PCR products and a number of proprietary plasmids digested with appropriate restriction enzymes to yield 17 fragments, suitable for use as molecular weight standards for agarose gel electrophoresis. The DNA includes fragments ranging from 50-1,500 base pairs. The 200 and 500 base pair bands have increased intensity to serve as reference points. The approximate mass of DNA in each band is provided (0.5 µg a load) for approximating the mass of DNA in comparably intense samples of similar size. Ready to use. Contains a unique combination of PCR products and a number of proprietary plasmids digested with appropriate restriction enzymes to yield 11 fragments, suitable for use as molecular weight standards for agarose gel electrophoresis. The DNA includes fragments ranging from 100-1,500 base pairs. The 500 and 1,500 base pair bands have increased intensity to serve as reference points. The approximate mass of DNA in each band is provided (0.5 µg a load) for approximating the mass of DNA in comparably intense samples of similar size. Ready to use. Contains a unique combination of PCR products and a number of proprietary plasmids digested with appropriate restriction enzymes to yield 12 fragments, suitable for use as molecular weight standards for agarose gel electrophoresis. The DNA includes fragments ranging from 100-3,000 base pairs. The 500 and 1,500 base pair bands have increased intensity to serve as reference points. The approximate mass of DNA in each band is provided (0.5 µg a load) for approximating the mass of DNA in comparably intense samples of similar size. Ready to use. Contains a unique combination of a number of proprietary plasmids digested with appropriate restriction enzymes and PCR products to yield 13 fragments, suitable for use as molecular weight standards for agarose gel electrophoresis. The DNA includes fragments ranging from 250-10,000 base pairs. The 1K and 3K bands have increased intensity to serve as reference points. The approximate mass of DNA in each band is provided (0.5 µg a load) for approximating the mass of DNA in comparably intense samples of similar size. Ready to use. Contains a unique combination of a number of proprietary plasmids digested with appropriate restriction enzymes and PCR products to yield 19 fragments, suitable for use as molecular weight standards for agarose gel electrophoresis. The DNA includes fragments ranging from 100-10,000 base pairs. The 500, 1.5K and 3K bands have increased intensity to serve as reference points. The approximate mass of DNA in each band is provided (0.5 µg a load) for approximating the mass of DNA in comparably intense samples of similar size. Ready to use. The DNA Ladder extended Range is composed of 14 individual DNA fragments: 25K, 10K, 8K, 6K, 5K, 4K, 3K, 2.5K, 2K, 1500, 1000, 750, 500, 250 base pairs. This product contains two enhanced bands (3K and 1K bp) for easy reference. The ladder is ready-to-use, which is premixed with loading buffer dye for direct loading on gel. This is no marker or ladder. Biomol F-BLUE for DNA Staining is a non-mutagenic alternative to Ethidium bromide. You can visualize the DNA bands with blue light (e. g. LED with 470 nm) avoiding strand breaks. With Biomol F-BLUE for DNA Staining cloning of gel purified DNA is much more successfull, since you can use blue light instead of UV light thus protecting the integrity of the DNA fragment to be cloned.